Fixing an Election | 2P START! Whenever there’s an election in America, there are lawsuits, allegations of fraud and intimidation, and about half the country upset with the results. Despite all the excitement and disappointment, I hope we can all reflect on how good it is to have a voice and have freedom. Anyway, I hope this light-hearted, semi-political comic is enjoyable to everyone! Also, Ray put in lots of detail on the ‘No on Wii Music’ folks, even though you can barely see them. I secretly love Wii Music for many reasons, but the avalanche of pathetic song choices keeps me from truly enjoying the game. Nintendo made a big mistake on their song choices. If you’re interested though, here’s my version of the Animal Crossing song. If you’d like to hear my rendition of the Zelda theme, check out our latest podcast! Hahahahaha, NCG. Miyamoto must have a lot of time on his hands. Epic, and explains a lot. NCG. Man, I haven’t said that in awhile. Bout time I commented on a comic huh? Well anyway, good comic. Nice comic guys! Haven’t we seen that news reporter before somewhere? Yes, in the decisions, decisions comic. I don’t see TiMii, but anyway, Free Dr.Pepper!!! . Apparently everyone(in America) gets free DP when the new Guns-N-Roses album comes out. So good for Tim. Is it just me or does Jan Janigan look strangely similar to someone we know? I wonder if its Alaskan news?? I wonder if its Alaskan news?? I kinda see what you mean, but I don’t think I would have ever thought about it unless someone pointed it out. As for the comic…I dunno…I got it, but I didn’t really laugh. Sorry, I don’t like to be mean, but I assume you’d like to know what people actually think. 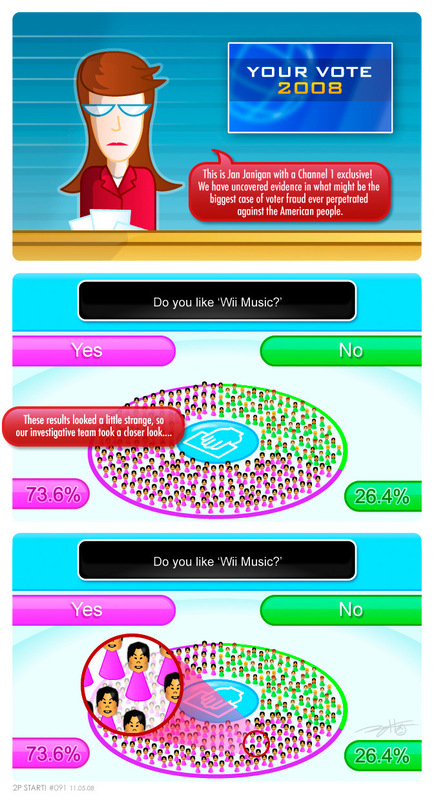 Maybe it’s because I’m a bit tired of the bashing of Wii Music. ;;^_^ Actually this almost seems more akin to an American Idol style joke where you have a couple of preteen girls voting for one dude 5 million times even though he’s bad. I dunno, I just didn’t think that Miyamoto doing that made any sense…Sorry. Oddly though I chuckled at the reporter’s name. Oh and the Animal Crossing remix was spiffy. Very much so. As for the comic…I dunno…I got it, but I didn’t really laugh. Same; I thought it was OK, but not great. People on GoNintendo seem to love it, though. I do like how a couple of the Miiamoto’s slightly left of center near the bottom are stepping on other Mii’s heads. And am I missing the joke with the reporter’s name? So Tim, are you still keeping your voting streak you mentioned a bunch of podcasts ago? Man, I dunno what happened, but the comics keep getting better and better! Lol @ Fisher Price Wii Music win by Shiggy. I think it’s more along the lines of Shiggy becoming a one man Wii Music Defense Force. He’s even taken plenty of swipes at current music game champions like Beatmania, Guiar Hero, and Rock Band. So I don’t really think it’s from a bashing Wii Music perspective as much as mocking Miyamoto’s constat defense of the game. While nowhere near as bad as Dyack, he has kind of made a clown out of himself recently. Also, for the record… you’re taking the words of quality on a Nintendo game from a website called GoNintendo which is notoriously fan by fanboys as a viable defense of a game. This is like me touting Resistance 2’s “betta than everything” status around postings on Playstation Underground and N4G. And am I missing the joke with the reporter’s name? I think its that it sounds like Jan, Jan again. That’s what I got from it anyway… Maybe I’m just weird. Why did Acorn’s scheme backfire? Mickey Mouse and Bugs Bunny were Republican! The Miyamoto clones are INVADING! My randomness is over for now. I just noticed Miyamoto has a skirt. There’s two little Wii reps standing on the heads of two other little Wii reps. In the front. Just to the left of the center. Believe me… I’ve seen this three times and that’s the first time I’ve noticed it, but it just popped out at me this time. ha ha! this one acctually made me laugh out loud! but as of now you raised the bar! I do like how a couple of the Miiamoto’s slightly left of center near the bottom are stepping on other Mii’s heads. This is a little late to ask but, what is your final verdict on Wii Music, Ray? Buy, rent, or just don’t bother with it? Boy… I really need to get around to reviewing all of these games…. I would recommend renting it. There’s just something special about the game that you’ll be able to enjoy, and you’ll be glad you found it. And when its time to return it, you’ll be happy you didn’t buy it. its wednesday. shouldnt there be a new comic up by now? Your lack of comic disturbs me. I love Star Wars referances! This comic should’ve just had the last panel by itself. people just expected a rock bandish kind of thing but its all about being creative and comming up with arrangements for songs.